The beautifully executed final Passacaglia bears ample testimony to the clarity, warmth and ideal resonance of the recording. Die Doppel-CD ist jetzt auf dem «hauseigenen» Label Maya Recordings erschienen. Und sie nimmt vom ersten Ton angefangen und lässt nicht mehr los. Die klangliche Vielfalt ist betörend, diegeigerische Virtuosität berauschend, das Auskosten tonmalerischer Effekte einums andere Mal hinreissend, und dennoch lebt Maya Homburger nicht einfachihre beneidenswerte Spieltechnik aus, sondern gibt sich mit Haut und Haar hinein in die spirituellen Ausdrucksbereiche dieser geistlichen Welten. Da wird das Lamento im Garten Gethsemane (Stimmung: As-Es-G-D) wunderschönmitgelebt und mitgelitten, oder ein explosionsartiger Ausbruch entfesselterEnergie am Ende der «Kreuzigung» beim Erdbeben selbst beim Hören der CD unmittelbar physisch nachvollziehbar. Vieles klingt fast wie improvisiert, und das liegt nicht nur an Bibers Vorlage, sondern auch an Maya Homburgers freiem Umgang mit dem Metrum. Ein Puls bleibt zwar immer fu.hlbar, aber Dehnungen, plötzliche Beschleunigungen oder unerwartete Atempausen halten das musikalische Geschehen in jedem Moment lebendig. Meilensteine setzt auch die Begleitung: So farbig und variantenreich, so virtuos und mit hörbarer Lust am Improvisatorisch-Freien der Generalbass-Auslegung wird nur selten barocke Musik verstanden und aufgefu.hrt. Dabei spielen sich Siobhán Armstrong (Harfe), Sarah Cunningham (Gambe), Brian Feehan (Theorbe), Malcolm Proud (Orgel und Cembalo) und Barry Guy (Kontrabass) aber niemals in den Vordergrund, es gibt keine Solo-Extemporationen, wie mandas befu.rchten könnte, wenn Musiker wie der Kontrabassist Barry Guy, die auch im Jazz zu Hause sind, losgelassen werden. Im Gegenteil: Die stilistisch bewusste Zuru.ckhaltung ist vorbildlich, und die Zutaten werden immer im Dienste des Ausdrucks und der Abwechslung im Klangbild vorgenommen. Insgesamt eine wundervolle Kombination von sinnlicher Barock-Pracht, mitreissender Musizierlust und meditativer Versenkung. With more stately dance movements and their doubles. Homburger is at her leisure with both - her virtuosity is beyond question, and she is spellbindingly graceful in the dances and variation sets. If you don't already have the Mystery Sonatas on your shelves, this would be an excellent introduction that you will savour for years to come. 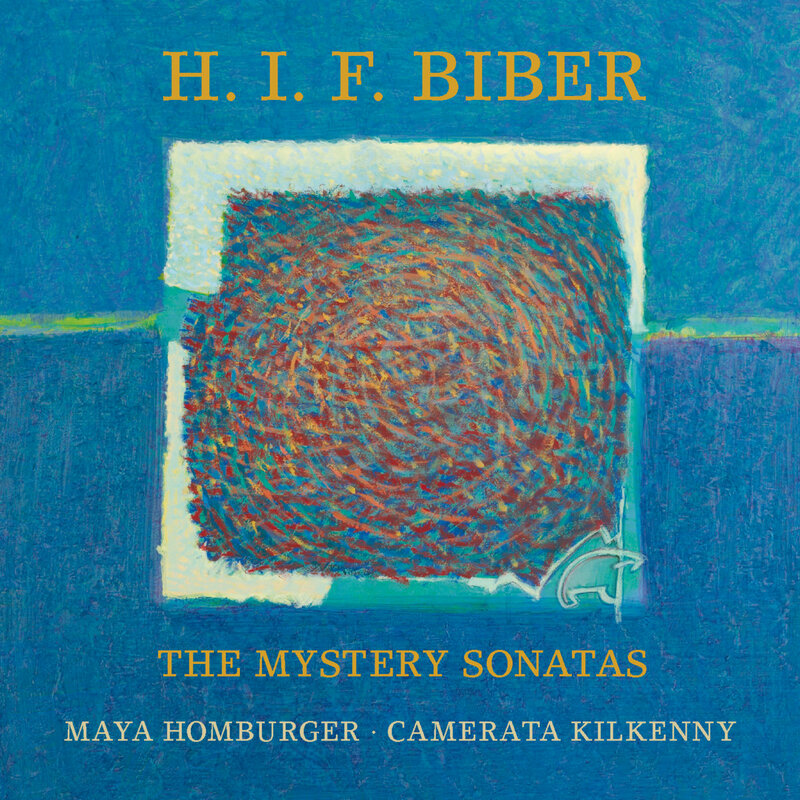 The last few years have seen a steady stream of new recordings of Biber’s Mystery Sonatas. It is tempting to hear each new one in comparison with what has gone before, so I am intrigued to find myself not hankering after other performers’ sounds here. One of the interesting features of this recording is the continuo group which comprises harp, viola da gamba, theorbo, organ/harpsichord with Barry Guy on double bass. Guy is equally distinguished in the worlds of early music and jazz, and he and Homburger have participated in a number of recordings that bring the two worlds together. Perhaps what is catching to my ear is the freedom that comes from the jazz musician’s respect for rhythm, and the gentlest of jazz touches on the bass line which are enough to excite the ear without upsetting the purist. The overall effect is surprisingly moving, clearly in touch with the spirituality of the sonatas, and with a masterful violin sound that is particularly effective in the final passacaglia for solo violin. tsr. ....Die Schweizer Barockgeigerin Maya Homburger hat die Biber-Sonaten, zusammen mit der Camerata Kilkenny, in der Propstei St. Gerold in Vorarlberg eingespielt. Das klingende Resultat darf man als eine ideale Verbindung von geigerischem Können, künstlerischer Reife und geistiger Durchdringung bezeichnen. Der Wechsel von improvisatorisch wirkendem und strengem Spiel – man höre sich etwa den ersten und den zweiten Satz der Auferstehungs-Sonate an – lässt die Grenzen von Zeit und Raum entschwinden. Die in jeder Sonate auf die jeweilige Tonart abgestimmte Skordatur der Violinsaiten ergibt überraschende klangliche Resultate. Der grosse Nachhall des Kirchenraumes versetzt den Hörer in eine abgehobene Stimmung. Und, last but not least, der Generalbass ist mit Gambe, Kontrabass, Theorbe, Harfe, Orgel und Cembalo überaus reichhaltig und abwechslungsreich gestaltet. The Mystery Sonatas of Heinrich Ignaz Franz Biber (1644-1704) are among the greatest violin works of the 17th century, but their demands are so unusual that you will rarely hear the set in a concert hall. The 15 sonatas, each named after a decade of the rosary, require different tunings of the violin, opening up unique worlds of sound and symbolism but making concert performances on a single instrument a practical impossibility, not to mention providing vertiginous problems for the performer. Swiss violinist Maya Homburger, who lived in Ireland for nine years up to 2004, has done more than anyone to bring the riches of these extraordinary pieces to life for Irish audiences. She has now recorded them, with Camerata Kilkenny providing a colourful five-person continuo. ..... La violoniste Maya Homburger, revenue en Suisse après de nombreuses années en Angleterre, a relevé le défi d’enregistrer l’intégrale du Rosaire. N’étant pas une spécialiste confinée uniquement à la musique baroque (elle est à l’aise aussi dans la musique contemporaine et l’improvisation libre), elle amène un regard frais sur ces pièces, tout en restant parfaitement respectueuse du style baroque. ... Maya Homburger tire de ses violons une sonorité ronde et maléable, son intonation est sans faille et ses doubles cordes parfaitment polyphoniques. La variété des instruments donne à chaque sonate une couleur et une atmosphère differente; en plus du clavecin et du théorbe, on salue la harpe parmi les cordes pincées. La contrebasse aussi est la bienvenue en complément de la viole, agile et parfait partenaire du violon. It was a joy and privilege never to be forgotten, to perform and record these sonatas in the Propstei St. Gerold which is a place in this world that really manages to connect heaven and earth and to induce in people a new kind of listening to their inner spiritual self and to each other. Special thanks go to Father Nathanael for his support and inspirational presence. They were conceived in all likelihood to accompany the rosary devotions in Salzburg and to be meditations in the traditional sense of Catholic Mysticism. Today they reach yet another level of spirituality since in performance the magical communication with the audience adds an extra degree of insight into the emotional and religious depths of these pieces. Even when played just with our duo of baroque violin and double bass we have had the most intense experiences with audiences within a wide range of festivals from old music events to Contemporary Music and even Avant-garde Jazz Festivals. The continuo group chosen for this recording allows us to bring out a wide variety of colours and illustrate closely the rapid emotional changes within the music. At this point I wish to thank my colleagues for their immense support, wonderful creativity and the ingenious way in which they reacted with great improvisational freedom to the many deeply involving images of the Rosary. The inclusion of the double bass is an homage to the many amazing occasions the two of us have shared over the years performing some of these sonatas as a duo, but I also feel that the 16 foot register provides the extra depth and earth bound dimension which balances the moments when the music seems to soar weightlessly into heaven. I have a great respect for the many extremely varied solutions to the continuo part and individual interpretations by my violin colleagues all over the world. The huge variety of approaches and their intensity also proves how close these sonatas are to everybody’s heart, and how deeply committed we all are to do them justice. In a similar way to Bach’s solo Sonatas and Partitas the Mystery Sonatas of Biber are with a violinist for a lifetime and constantly develop and change with our own personal growth and also through the two-way communication with audiences. H.I.F. Biber (1644-1704) was born in Bohemia in the small town of Wartenberg and considered one of the finest violin virtuosos and composers of the 17th century. His reputation as a violinist survived into the late 18th century, when the English historian Charles Burney described him thus: "...of all the violin players of the last century, Biber seems to have been the best, and his solos are the most difficult and most fanciful of any music I have seen of the same period." His musical education might have been at a Jesuit School, which would also explain his close affinity to the Rosary devotion. But it is not known for sure. After serving the Count Liechtenstein-Kastelkorn of Olmütz and Kremsier, he entered the chapel of the Archbishop of Salzburg in 1670, where he remained for the rest of his life, rising to the posts of Kapellmeister and Dean of the Choirboy School. His 15 Mystery or Rosary Sonatas can be dated between 1670 and 1680. They survive in a beautiful manuscript, in which a small engraving depicting one of the fifteen Mysteries of the Rosary precedes each sonata. In the manuscript the 15 Mystery Sonatas are followed by a Passacaglia in G minor for unaccompanied violin. A picture of a guardian angel leading a child prefaces it. The rosary devotions were often associated with the feast of the Guardian Angel, celebrated during the month of October, and Biber creates a work suitable for this occasion by basing it on the four notes G, F, E flat, D which relate to the first line of the hymn 'Einen Engel Gott mir geben'. A special technique distinguishing the sonatas is the use of scordatura: the retuning of the violin strings to a variety of tunings. Among the most unusual are for example A flat, E flat, G, D (No 6) or B, F sharp, B, D (No 3). There are a total of fifteen different tunings in the whole collection. Scordatura is notated in the manner of certain tablatures in that the violinist is told where on the string to place the fingers, but the audible pitch is different from the notated, visual pitch. The most extraordinary scordatura tuning appears in the Rosary Sonata XI ('The Resurrection'), which requires the violinist to interchange the middle two strings, crossing them below the bridge of the violin and above the nut, resulting in a symbolic cross shape. This means the D string sits in the position of the A string and vice versa. The Scordatura itself transports the performer into another world. It is not possible anymore to play with “normal” instincts. Simple mechanisms, ingrained in your system since childhood are turned upside down, since the notated music you see, bears hardly any relationship to what you actually hear. This immense intellectual effort, together with the overwhelming emotional impact which changes dramatically from one sonata to another leads to an almost trance-like state and a detachment from the self and from so-called virtuosic violinistic playing. Biber’s mastery, both as a composer and as a violinist are also evident in his handling of the various musical forms. The toccata like Preludes and Finales alternate between extremely virtuosic passages (symbolising excitement and happy anticipation, or else torment and pain) and recitative inserts, leading the listener into the unfolding story with a high sense of drama, whilst the Sonatas and Canzonas are more reflecting, even pastoral at times. The dance movements and Arias with their Doubles and Variations evoke a wide variety of changing moods and atmospheres. Thanks to the intensity of Biber’s compositions the essence of religion and human existence can be reflected upon in a meditative way. I hope that through his work, core issues of our life, emotions like compassion, hope, joy, trust, anxiety, torment, anger, pain, fulfillment and release, can be conveyed musically and reach deep into our soul. Es ist ein Privileg und eine grossartige, unvergessliche Erfahrung , dass wir die Rosenkranzsonaten in der Propstei St. Gerold aufnehmen durften. Dies ist wahrhaftig ein Ort wo Himmel und Erde sich begegnen, der die Menschen zum Innersten führt und auch füreinander öffnet. Wir danken Pater Nathanael von ganzem Herzen für seine Begleitung und inspirierende Präsenz. Es ist höchstwahrscheinlich dass die Mysteriensonaten bei den Rosenkranzandachten in Salzburg erklungen sind als Meditationen im Sinne des Katholischen Mystizismus. Heute wird der spirituelle Gehalt dieser Werke noch erhöht, da während einer Aufführung die wundersame Begegnung und Austausch mit dem Publikum uns noch intensiver in die emotionalen und religiösen Tiefen von Bibers Kompositionen führen können. Mit der Continuo Besetzung die wir für diese Aufnahme gewählt haben möchten wir eine Vielfalt von Klangfarben erreichen um die schnell wechselnden Emotionen und Atmosphären in der Musik zu illustrieren. An dieser Stelle gebührt Dank meinen Musiker Kollegen für ihre wunderbare Unterstützung, Kreativität und die Art und Weise wie sie mit grosser improvisatorischer Freiheit auf die zutiefst berührenden Rosenkranzbilder reagierten. Die Einbeziehung des Kontrabasses ist eine Hommage an zahlreiche, intensive Aufführungen von einigen dieser Sonaten die wir als Duo bestritten haben und ich hoffe auch, dass das dunkle, tiefe Register eine Balance kreiert zu den Momenten wo die Musik scheinbar schwerelos zum Himmel steigt. Ich habe grossen Respekt für die enorme Vielfalt von Lösungen der Continuo Besetzung und die immer wieder überraschenden und aussergewöhnlichen Interpretationen meiner Geigen Kollegen in aller Welt. Dies zeigt auch , wie nah uns diese Werke stehen und wie sehr wir uns bemühen ihnen gerecht zu werden. In ähnlicher Weise wie die Sonaten und Partiten von J.S. Bach, sind die Rosenkranz Sonaten von Biber eine lebenslange Herausforderung für viele Geiger/innen und entwickeln sich laufend mit zunehmender Reife und Dank der Kommunikation mit dem Publikum. Über seine Jugendjahre ist wenig bekannt, aber es ist sehr wahrscheinlich dass er seine musikalische Erziehung an einer Jesuiten Schule erhielt, was auch seine Affinität zum Rosenkranzgebet erklären würde. Nach Jahren im Dienste von Graf Liechtenstein-Kastelkorn von Olmütz trat er 1670 in die Dienste des Erzbischof Max Gandolph von Salzburg ein , wo er zum Kapellmeister aufstieg und bis zu seinem Lebensende blieb . 1690 wurde er in den Adelsstand erhoben. Die Rosenkranzsonaten können in der Zeit zwischen 1670 und 1680 angesiedelt werden. Im wunderschön gefertigten Manuskript das heute in der Bayrischen Staatsbibliothek in München liegt, ist jeder Sonate ein Kupferstich vorangestellt, der eine der Stationen des Rosenkranzes abbildet. Am Ende des Zyklus steht eine Passacaglia in g-Moll für solo Violine, eingeleitet vom Bild eines Schutzengels, der ein Kind an der Hand führt. Die Rosenkranzandachten waren oft mit dem Fest des Schutzengels verbunden, das damals im September und Oktober gefeiert wurde. Biber passt das Werk diesem Fest an mit der Verwendung des absteigenden Bass Themas g, f, es, d in Anlehnung an die Hymne “einen Engel Gott mir geben”. Die Sonaten sind nicht nur durch die Mysterien Abbildungen miteinander verbunden, sondern auch durch die Verwendung der sogenannten SCORDATUR Hierbei werden die Saiten der Geige so umgestimmt, dass nicht mehr die üblichen Quinten G,D,A,E die Grundstimmung bilden. Statt dessen hat jede Sonate ihre eigene Stimmung. Notiert wird dies quasi in Tabulatur: der Geiger liest die Noten als Griffschrift, nicht eigentlich als klingende Noten. Die AUFERSTEHUNG CHRISTI Sonate XI weist die aussergewöhnlichste Stimmung auf, bei der man die beiden Mittelsaiten hinter dem Steg und im Wirbelkasten überkreuzt, so dass die D Saite nun an Stelle der A Saite sitzt und umgekehrt. Die Scordatur selbst versetzt uns in eine andere Welt. Es ist nicht mehr möglich, mit den “normalen” Instinkten zu spielen, simple Mechanismen die man seit Kindheit eingeübt hat, müssen auf den Kopf gestellt werden. Das Notenbild hat oft keine Relation zum Gehörten mehr (da man ja eine Griffschrift interpretiert und nicht die Noten sieht die man hört) . Die immense intellektuelle Anstrengung die dies erfordert , zusammen mit dem überwältigenden emotionalen Affekt der von Sonate zu Sonate dramatisch wechselt führt zu einer fast tranceartigen Loslösung vom Ich und vom sogenannt geigerischen, virtuosen. Bibers Phantasie und Können, sowohl kompositorisch als auch geigerisch zeigen sich auch in der Handhabung der verschiedenen Satztypen: die toccatenhaften Präludien und Finale mit dem Wechsel zwischen äusserst virtuosen Passagen (freudige Erregung, Erscheinungen, oder aber Zwiespalt, Auflehnung symbolisierend) und rezitativischen Einschüben, führen den Zuhörer mit direktester Dramatik ins Geschehen ein; wogegen die kontrapunktische Sonata und Canzone durch ihren Duktus betrachtend schildern. Wie unvergleichlich werden die Mühsal der Kreuztragung, psychische und physische Vorgänge in einem gezeichnet. Die Tanzsätze und Ariae, ihre Doubles und Variationen wirken in ihrer einmaligen Vielfalt und Gegensätzlichkeit äusserst bildhaft. Dank der Intensität von Bibers Kompositionen werden Inbegriffe vom menschlichen Dasein, und vom göttlichen Potenzial im Menschen meditativ betrachtet und dadurch verstärkt erfahren. Grundinhalte unseres Lebens, Gefühle wie Vorfreude, Hoffnung, Versprechen, Vertrauen, Mitgefühl, Angst , Zwiespalt, Wut, Ohnmacht , Schmerz, Todesangst, Erlösung und Erfüllung werden musikalisch vermittelt und dringen so bis ins Innerste.